Our first (and only) full day in Cádiz, and whenever we visit a city for the first time, as I mentioned in our last post, we do tend to opt for the convenience of a Big Red Tour Bus - they are an excellent way of getting one’s bearings and identifying the best places to visit in the short time you might have. As Cádiz is practically traffic-free in the very centre, the bus tour does a circuit around the outer edge and along the coast walls. The 24 hour tickets allow you to hop off and hop back on whenever you like, so when you want to cover a fair bit of ground in one day, these tickets make complete sense (€18 each, for the 24 hours). Using Sam Chesterton’s recommendations for places to eat, we plotted the rest of the day, making sure that by lunch we were up by the Iglesia del Carmen (a pastel confection of a church with strong Latin-American influences), from where we would be able to wend our way slowly back to the hotel. The morning leg gave us plenty of time to hop off again and visit the Cathedral - part gothic and part neo-Classical (it took 116 years to build), sitting right beside the sea, it’s gold tiled dome glinting in the sun to attract the attention of passing ships. I love ecclesiastical architecture, even though I am not even remotely religious, but as symbols of power, wealth and mystery these grand spaces are truly awe-inspiring. Andrew is less enthusiastic and sometimes finds the overdose of religious symbolism, and the content of the audio guides, a little too much, so we saw what we needed to see and then clambered up one of the bell towers for a view of the whole city. Being on a small peninsula surrounded by the sea, Cádiz is a flat city, so any elevation affords a great view over the rooftops. That said, it is really the sea and the coastline that is the draw, and it quickly becomes evident that this is a very exposed stretch of coast. It is easy to forget that this is the Atlantic, and not the more sheltered Mediterranean, and the wind certainly reminds you of the fact. 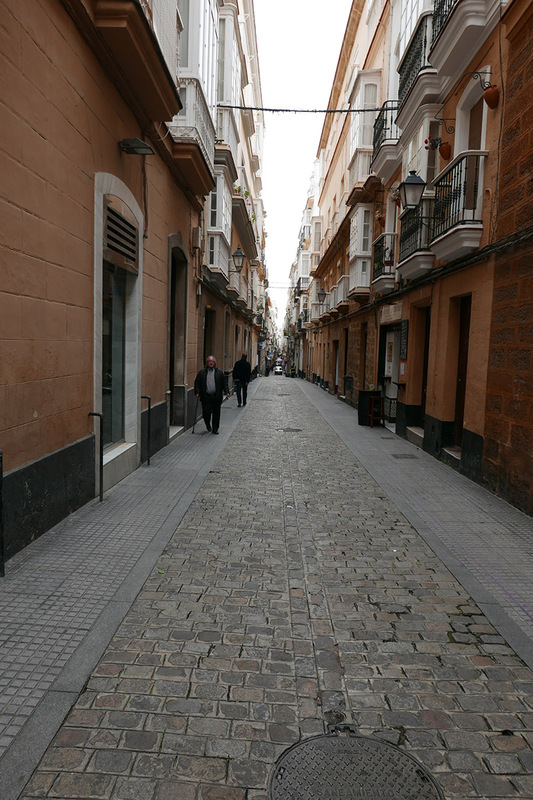 Contained as it is by the sea, Cádiz old town is easy to walk around. Its narrow streets are pretty, filled with history and its low profile hides a rich cultural heart. Cádiz was the birthplace of composer Manuel de Falla, and indeed the cathedral crypt houses the remains of de Falla. It is also clear that the city is gaining a reputation as something of a gastronomic mecca - there are bars and restaurants everywhere, and from our limited exposure it seemed that it would be hard to find a bad one. We had a very pleasant stop in a sherry bodega, sampling all sorts of delights from great wooden barrels; had coffees and pastries in bright, well-populated cafeterías beside squares or looking out onto bustling commercial streets. My one criticism might be that, if you were in search of some serious retail therapy, then Cádiz might disappoint. There is a branch of the ubiquitous El Corte Inglés just outside the city walls, and there may well be a collection of more recognisable retail outlets huddled alongside. Then again, we were not here to shop, and it would be churlish to suggest that Cádiz is any the poorer for any lack of modern-day commercialism. You can always go to nearby Jerez de la Frontera to visit Luz Shopping, if you really need to spend money. We saw the recently excavated Roman Theatre, most likely built in the 1st Century BC and one of the largest in the Roman Empire, had huge goblets of gin (we didn’t drink all the time! ), walked beside the delightful Parque Genovés, past the Castillo de Santa Catalina and the Lighthouse. We would certainly recommend a visit to the Cámara Oscura in the Torre Tavira, right in the heart of the old city. Neither Andrew nor I had ever been to a Camara Oscura, and the guide gave us an illuminating tour of the city using the magic of a periscope-like tower, the mirror and lenses of which reflected the entire surrounds onto a bowl-like screen - fascinating! I found it interesting that in the history of this city, the Muslim influence was relatively low key (the Moors were here from 711 to 1262), when compared to the great former Arabic settlements of Seville, Cordoba and Granada. The Phoenicians and Romans had settlements here, and the Muslims did have a presence until Alfonso X of Castile claimed it in 1262. The city’s renaissance arrived with the Age of Exploration (from the end of the 15th Century up to the 18th Century), and Columbus sailed from the port on his 2nd and 4th voyages. It became a hugely strategic hub, and consequently a major target for enemies of Spain. A second Golden Age arrived in the 18th Century due to its dominance as a centre for overseas trade, and its importance was underlined when the Spanish Constitution of 1812 was proclaimed here. Despite its history and importance, there is a humility about Cádiz; it doesn’t brag, and there is nothing brash or tawdry. It is quietly elegant: a city that has borne the brunt of its strategic location and the blasts of Atlantic winds and high seas, and remains steadfast. I feel we need to return, as we have but scratched the surface.